Horndean, Hampshire based Di-Spark Group is a well known precision engineering subcontractor that offers its domestic and overseas customers a wide range of advanced machining services. Although the company’s name gives an obvious clue as to its origins, over the past 30 years Di-Spark’s world-class wire erosion and spark erosion facilities have been augmented by an impressive collection of advanced 5-axis milling and multi-axis mill turning machine tools and a wide range of associated plant. Di-Spark’s proactive approach to the demands of its customers and its responsiveness to changes in the marketplace has seen the company evolve from its tool making background, using wire erosion techniques for the production of press tools for the printed circuit board industry; to what is now a renowned multi-disciplined manufacturer of complex machined components. The range of demanding industries served by Di-Spark, now include the aerospace, defence, medical, oil and gas, motorsport, nuclear and scientific sectors. 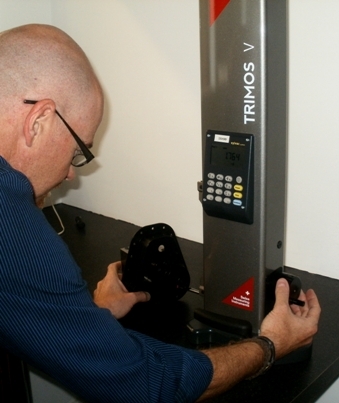 Available in the UK from Bowers Metrology, Trimos V Series models cover measuring capacities from 300mm – 1000mm, all internal and external diameter measurements are accomplished with the help of a unique floating carriage system and a built-in air pump that helps reduce user fatigue. The advanced Trimos gauges operate via rechargeable batteries that can run for 120 hours on a single charge. For more information on the Trimos V600, click here.